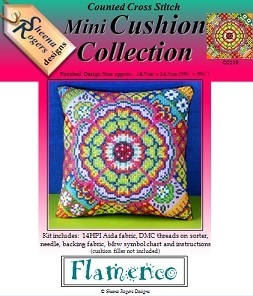 This flamboyant mini cushion design is full of the passion and flavour of Flamenco dancing. Inspired by the traditional dress of the Spanish dance, there are frilly swirls and fan shapes created with hot, passionate colours. This Flamenco mini cushion cross stitch kit includes: 14HPI white aida fabric, ready-sorted DMC stranded cotton threads on sorter, needle, backing fabric, b&w symbol chart and instructions (cushion filler not included). Only whole cross stitch is required to stitch this design (so no fractionals or backstitch! ).